Virgin TV to show French Open tennis in 3D | What Hi-Fi? If you subscribe to Virgin TV's V+ HD or TiVo service, and have a 3D telly, you'll be able to watch the French Open tennis tournament in 3D this month. 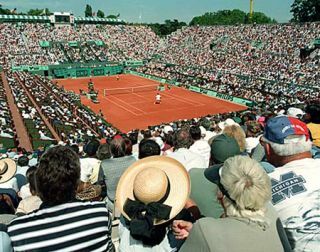 Virgin will broadcast Eurosport's live coverage from centre court at Roland Garros, Paris, in 3D from May 22nd until June 5th. Live games will be shown on Virgin Media channel 523, and viewers will also be able to relive the action through Virgin's 3D-on-demand service. If you don't have a 3D telly, the games will be shown on Eurosport HD in 2D (Virgin channel 522) as well. With Rafael Nadal defending his title against Andy Murray, Novak Djokovic and Roger Federer, and Caroline Wozniacki taking on returning champion Francesca Schiavone, Virgin promises "every big forehand, backhand, volley and smash in glorious 3D". Jean Thierry Augustin, Eurosport's managing director for distribution, says: "The iconic clay courts of Roland Garros are the perfect stage to demonstrate the progress being made in 3D sports broadcasting." For those who don't have access to Virgin TV, Panasonic will broadcast the French Open in 3D to 650 of its retail stores across the UK and Ireland. UK viewers will also be able to watch this year's Wimbledon final in 3D at selected cinemas around the UK.